A Canon EOS 4000D DSLR was placed at the Cassegrain focus of a Skymax 127 Maksutov. 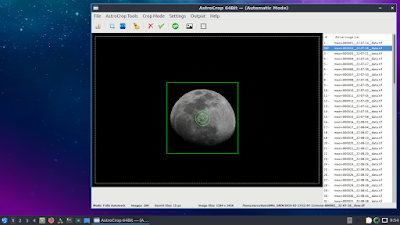 The camera was controlled by USB tethering to a Lubuntu Laptop running AstroDMx Capture for Linux. 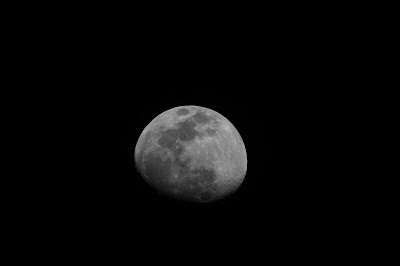 50 images of each of two overlapping Panes of the 86% waxing, gibbous Moon were captured as tiff files. The best 80% of each set of 50 images were stacked in Autostakkert! running in Wine. The resulting images were cropped in the Gimp to their original sizes of 5184 x 3456 and then stitched in Hugin Panorama creator. 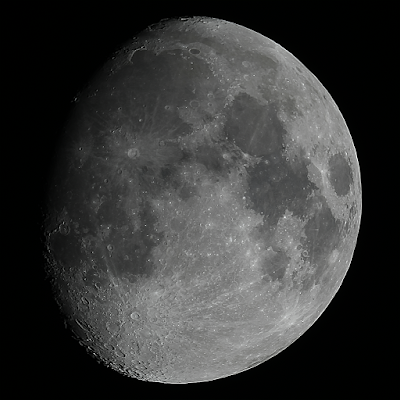 The resulting image was wavelet processed in Registax 5.1 running in Wine and post processed in the Gimp 2.10. A Canon EOS 4000D DSLR was placed at the Newtonian focus of an f/5, 130mm Newtonian. 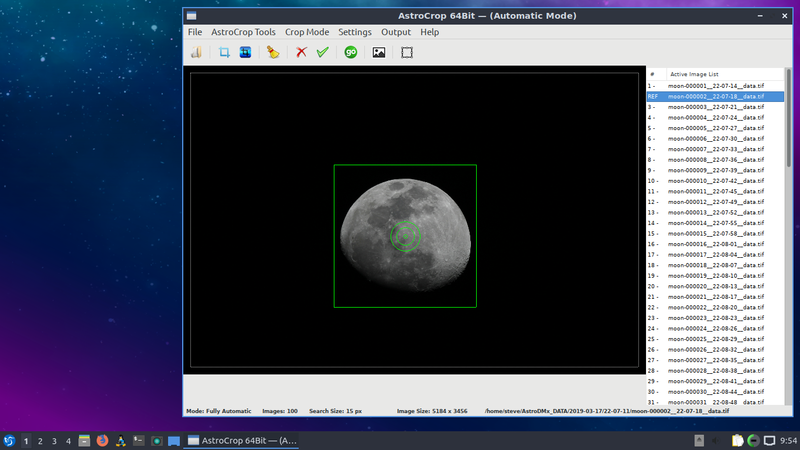 The camera was controlled by USB tethering to a Lubuntu Laptop running AstroDMx Capture for Linux. 100 images of the Moon were captured as tiff files. 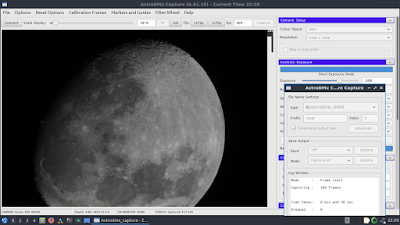 The 100 images were precisely cropped to 1600 x 1600 pixels in Nicola's AstroCrop for Linux. The best 90% of the cropped images were stacked in Autostakkert! 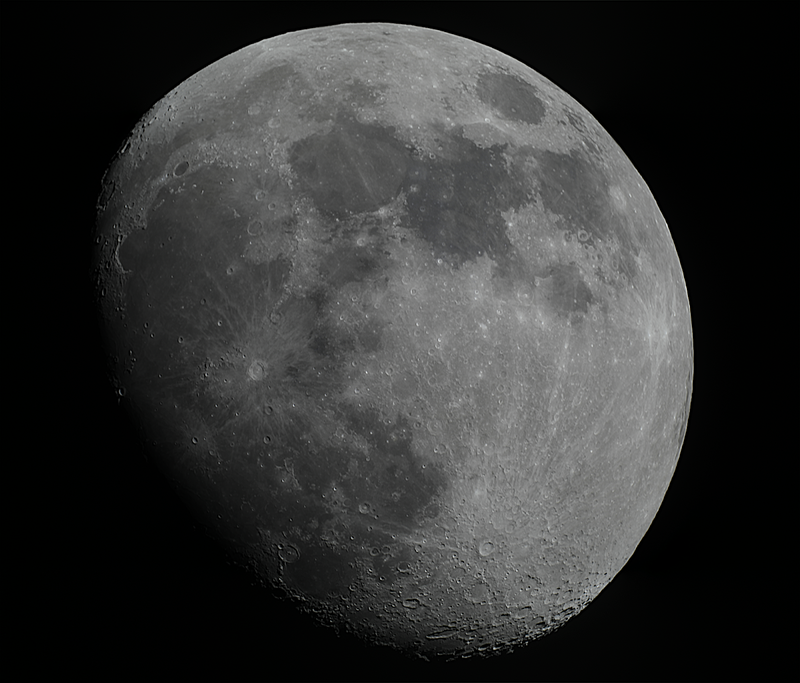 and wavelet processed in Registax 5.1, both running in Wine. 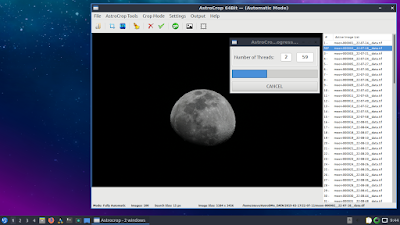 The resulting image was post processed in the Gimp 2.10.